Pyrolysis Gas Chromatography (Py-GC) is a method of chemical analysis in which organic material is heated and thermochemically decomposed without participation of oxygen to produce smaller molecules that are separated by gas chromatography and detected using mass spectrometry. Py-GC has been well used especially characterization of polymer sample, as well as for polymer quantitative and qualitative analysis, structural analysis in detailed point and thermal stability analysis. 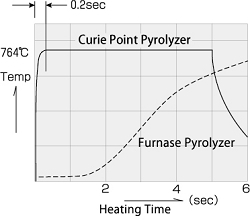 Curie point Pyrolyzer uses pulse heating method applied with induction heating and curie point of ferromagnetic properties. When ferromagnetic properties receive induction heating, it loses its magnetic properties and reaches up to its curie point temperature in an instant. JAI has developed 21 types of pyrofoils each with its unique and reproducible curie point temperature. Sample heating is very rapid and reaches to equilibrium temperature within 0.2 second. Equilibrium temperature is very accurate and stable at ±0.1℃. Since the maintenance oven can be set at a higher temperature (400°C ), higher molecular weight of the pyrolyzates can be analyzed. The pyrogram on the left was obtained from pyrolysis of polyethylene at 740°C for 5 sec. The pyrogram shows parafiin and olefin peaks of carbon number up to 80 as pyrolyzates. The pyrogram shown above was obtained from polystyrene pyrolyzed at 590°C for 5 sec. 4 peaks of tetramer of styrene are clearly detected. ' Also, pentamer peaks were observed which are normally difficult when using a standard capillary column.